Therapy band is a perfect tool for many patients as they move forward through the rehab process after an injury or surgical procedure.Thera-Band Exercise Band provides a color-coded system of progressive resistance to help increase strength and improve range of motion. Our Thera-Band Dispensing System is a convenient solution for clinicians interested in the potential of distributing exercise band to their patients. 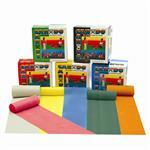 Try Cando Exercise Band for economical therapy band that utilizes the Thera-Band color sequence. We also carry Latex Free Thera-Band and Latex Free Cando Therapy Band for clinicians who want the characteristics of a latex therapy band, in a latex free option. 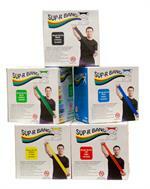 If you’re looking for the perfect Therapy Band solution, shop our selection of latex and latex-free bands today! THE Standard in Exercise Band!